After the arrest of Rodrigo Arechiga Gamboa, also known as "El Chino anthrax " Claudia Ochoa Felix became the alleged leader of the anthrax . This group is the band of assassins who does the bidding of Ismael " El Mayo" Zambada , a leader of the Sinaloa Cartel , a Mexican drug trafficking organization led by also captured drug lord "El Chapo " Guzman . Nicknamed the " Empress of the anthrax ," Ochoa Felix , about 27 years, has openly when show on his Twitter account his great physical attractiveness and their many possessions . His photos are often of her posing scantily clad ( in his Facebook profile says he studied modeling ) , or showing their luxuries , ranging from travel , quality spirits and powerful weapons to high-end cars and huge mansions. In his last photos, she can be seen touring Machu Picchu. 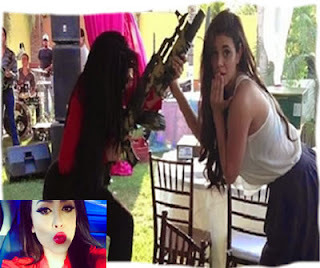 According to various rumors, Felix Ochoa was the target of the murder in early May Yuriana Castillo Torres, alleged girlfriend Aréchiga and who had a strong physical resemblance . Castillo Torres was kidnapped out of the gym on May 6 . His body was found hours later with signs of extensive torture. Although it is known as the most powerful woman in Sinaloa , there is no official statement on her and not on any report , according to the Mexican newspaper Excelsior. Arechiga , who was arrested in the Netherlands in December 2013 , will be extradited to the U.S. , where he will be tried for drug trafficking. It is one of the founders of anthrax Virus poster attached to the Pacific cartel , Joaquin "El Chapo " Guzman and Ismael "El Mayo" Zambada, which operates mainly in Culiacan organization.